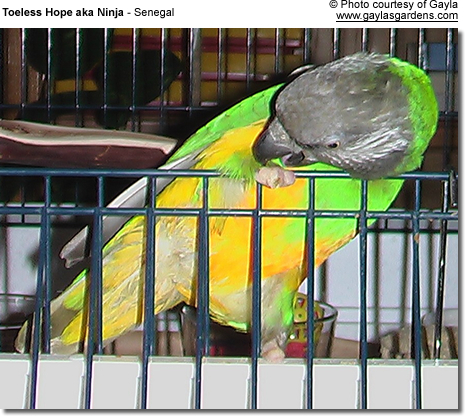 Featured on this page is "Toeless Hope" aka "Ninja"
... named such because of the amazing things Hope can do without her toes. 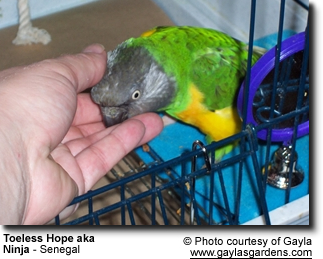 Gayla found Hope at a local bird rescue, where she spotted Hope in the bottom of her cage. Gayla had gone to the rescue to trade cages, not to adopt another parrot. But, after Gayla noticed that Hope had no toes, she felt so sorry for her and knew she would probably have a hard time being adopted. Hope was also flightless. Hope's parrot parents had bit all her toes off and her wing tips on her left wing. Gayla had not planned on adding to her flock of 2 other parrots. But within 5 minutes of meeting Hope, there was no question, she was coming home with her. She likes to hang out on the side of the cage as she sways back and forth, on her wooden plank. For the first time in Hope's life, she now has a perch made just for her-no more plank, on her sun perches which are covered with soft material. Hope loves to dance, whistle with me and say "come'er and "pretty bird". Since Hope is toeless, Gayla cleans out her cage twice a day to make sure Hope doesn't step in poop. Gayla uses a precut paper cage liner just for her cage that she got off of ebay. Hope is fed twice a day with fruit, veggie, seeds, pellets and her homemade birdy biscuits. She loves nutri-berries, peanuts in the shell*, red grapes, spinach, corn and apples, as well as banana chips. Hope loves the head massages Gayla gives her. Since Hope is toeless, Gayla cleans out her cage twice a day. She found out trying to do a real quick poop clean-up with a paper towel on her plank or the bottom of the cage without removing either from the cage to clean it, is unacceptable to Hope. She will come after Gayla's hand and the paper towel like a wild bungee and bite like there is no tomorrow. She doesn't just lunge, she bites and you have to unclamp her beak to detach her. Gayla reports that she has seen stars as a result.